Across the design world bathrooms are really having a moment… Whether it be the famous pods at Sketch London, the pretty-in-pink powder room at Annabel’s, or the checkerboard at The Ned. It’s time to make your bathroom a ‘place to be’, somewhere you want to freshen up (and take a selfie). As you may have noticed across our social channels, we are championing confident colour this year. Each of our seven new hues has been carefully crafted to bring fresh, fluid energy to your space – and the best place to make a big colour statement? The bathroom walls, obviously. With a nostalgic nod to the fifties, we’ve got to give Mamie Eisenhower a little credit for our sassy new shade – Delilah – and are totally fine admitting our weakness for pink-mania. When imagining Delilah, we gave Mamie Pink a contemporary update which subtly played to Pantone’s Living Coral whilst still being easy (and beautiful) to live with. So! We recommend splashing her all over the walls – woodwork and ceiling included. 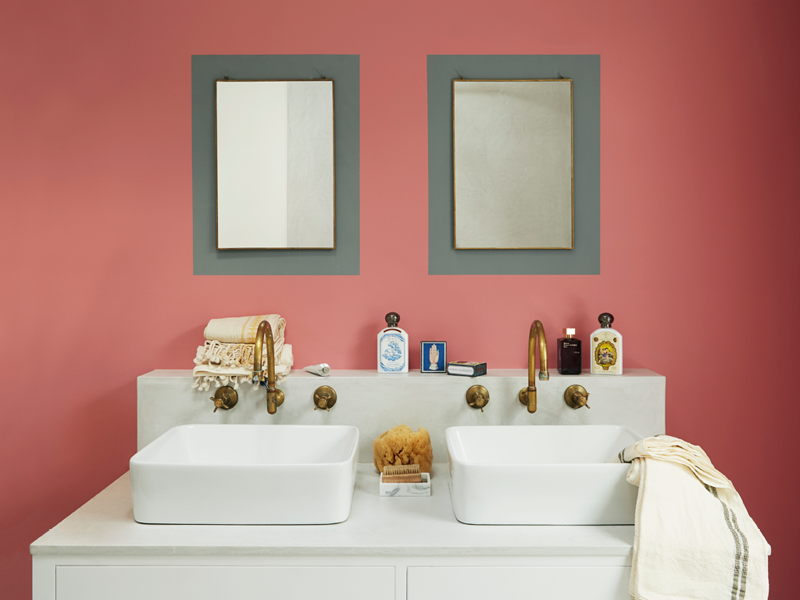 Use a cooler, neutral tone to balance the scheme and accentuate key areas within the bathroom – mirrors or artwork. Remember to have fun with your space, paint/shape innovations are trending after all. We may be bias but we really do believe pink to be the perfect colour to freshen up with – maybe it’s the fun-loving energy or the springtime connotations but it sets you up for the day the right way. If you’re inspired to try this shade of pink perfection head to our sample shop now!